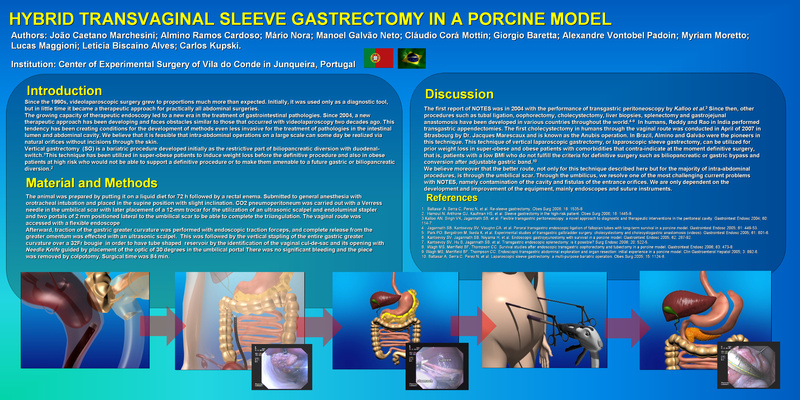 Hybrid Transvaginal Sleeve Gastrectomy in a Porcine Model. INTRODUCTION – The authors describe the first transvaginal sleeve gastrectomy with an additional trocar in umbilicus in a porcine model. Our purpose is prove that bariatric procedures can be realized by NOTES (Natural Orifice Translumenal Endoscopic Surgery). METHODS AND PROCEDURES – A female pig with 50 pounds was underwent to a general anesthesia. Pneumoperitoneum and a 12mm trocar was put in the umbilicus and colpotomy was made with an endoscope. A 32 Fr bougie was placed into the stomach and its greater curvature was taken out by stappling after liberation with an ultrasonic knife of the grater omentum. The specimen was taken out by the colpotomy. Total surgical time was 150 minutes. CONCLUSIONS – We conclude that NOTES is a new and safe technique and bariatric procedures like sleeve gastrectomy are feasible and can be done. More studies in animals models are necessary before doing this kind of surgeries by natural orifices in humans.